At first glance, Cuttin' It seems like a very crass title for a new show at the Young Vic about female genital mutilation (FGM). But the title of Charlene James's new play — which highlights the disturbing growth in the practice among communities within the UK — actually reflects the streetwise slang used by her feisty teenage protagonist. Muna (Adelayo Adedayo) is a stroppy but savvy young Londoner who tells her story with a quick-witted cheekiness that belies its darkness. 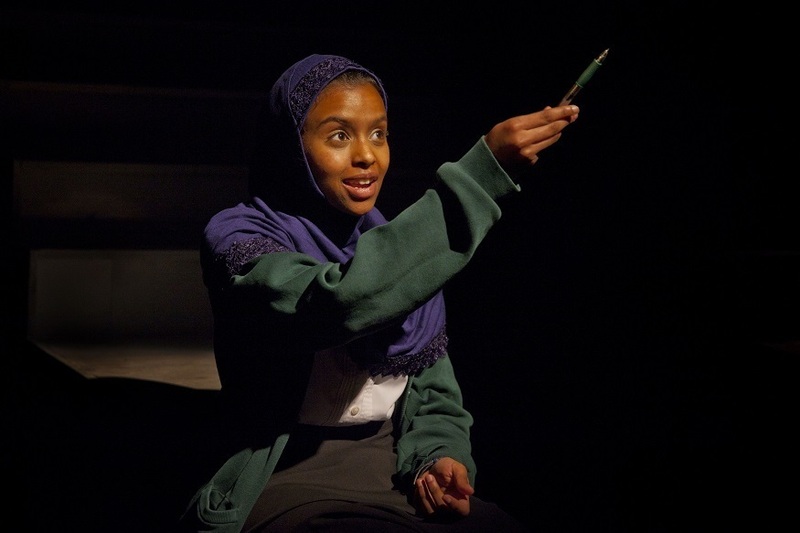 Sitting on Joanna Scotcher's steeply tiered concrete school steps, she meets fellow British-Somali Iqra (Tsion Habte). Despite the lack of any discernible similarities, they are drawn together. Muna is rebelliously cool while Hijab clad refugee Iqra is quiet and friendless, but they are tied by the same cultural roots and by the fact that they have both, like an estimated 500,000 other women living in Europe today, undergone the trauma of FGM. The steps feel like neutral ground, a stage within the play on which the two girls recount their narrative. Muna and Iqra are as much representatives of the two sides of the argument around FGM as they are characters reeling from personal experience of the ritual. Unswervingly honest in its portrayal of the views and behaviours of those who practice and oppose FGM, Cuttin' It's success lies in the incredible naturalism and emotional maturity of the young actors. From the moment she boldly introduces herself to us, Adedayo draws constant laughs from the audience, her charm making Muna's story all the more heartbreaking. Similarly, Habte's portrayal of Iqra is outstandingly good, especially during the story of the day she is cut, her voice quavering with fear at the memory. So it is all the more surprising when we learn that Iqra not only supports the practice but actually helps perform it. As the play progresses and their opposing positions on the subject become more apparent, the steps come to represent a soap box on which the two girls express and grapple with their differing opinions. At times it feels that the teenagers are too uniformly articulate and this weakens the narrative — it feels like James is speaking through her characters to express her own thoughts. Cuttin' It raises awareness of this issue in the best possible way — by portraying the stories of two individuals that represent the experience of thousands. It is a call to action and a powerful message of defiance towards the continued practice of FGM in over 40 countries (including illegally in the UK) worldwide. Cuttin' It is on at the Young Vic, 66 The Cut, SE1 8LZ until 11 June. Tickets £10-£25. Londonist saw this show on a complimentary ticket. The show will transfer to the the Royal Court, Sloane Square, SW1W 8AS 23 June-13 July and The Yard Theatre, Unit 2a Queen's Yard, E9 5EN 26-30 July.